Yes, that's my daughter's toilet. No, I have no shame. But, I was just so excited when I got the Little Looster in the mail I had to take a pic! I can't even begin to describe what a life saver this little horseshoe stool has been to my household! 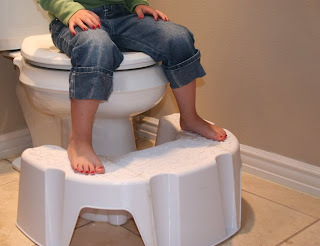 My daughter is very much potty trained but she still requires a potty seat and a step stool to use the "big girl potty" all on her own. Which, as an adult can be quite annoying when you have to push all those gadgets aside just to use the potty. Not to mention when you come home, with an "emergency" and have to run to the closest bathroom, scrambling to get all these things out of the way is not good. This is why we avoid my daughter's bathroom at all costs. The Little Looster however is a wrap around stool that doesn't need to be shuffled around when others use the bathroom. It doesn't get in the way for adults whatsoever and it has become the boost my daughter needed to use the potty seat no more. The Little Looster eliminates her feet from dangling and helps support her so she doesn't feel like she's falling in. The first thing she said when she tried it out was "look mommy, I have a big girl potty now!" and is showing off her Little Looster to anyone who will come see--I think that is one happy camper! Whether your going to start potty training, or in the process, or have a potty training expert I promise you this will make your life so much easier. You NEED this. Oh my word, this booster stool is great! I'll have to remember it when I'm potty-training Brady. Thanks for the great product review! LOL - i love your commentary in your post about rushing into the bathroom and tripping over stools and gadgets around the potty! Can so relate to those moments! I only wish I saw this stool a year ago! Oh well maybe next time! Hello! I just wish to give you a huge thumbs up for the great information you have right here on this post. I am returning to your web site for more soon.